Locoweeds belong to the large and diverse genus of flowering plants Astragalus (Fabaceae), with approximately 2,000 different species in the northern hemisphere, 380 species in North America, and 94 species in California. Some are rare endemics that only occur in one isolated mountain range or canyon. 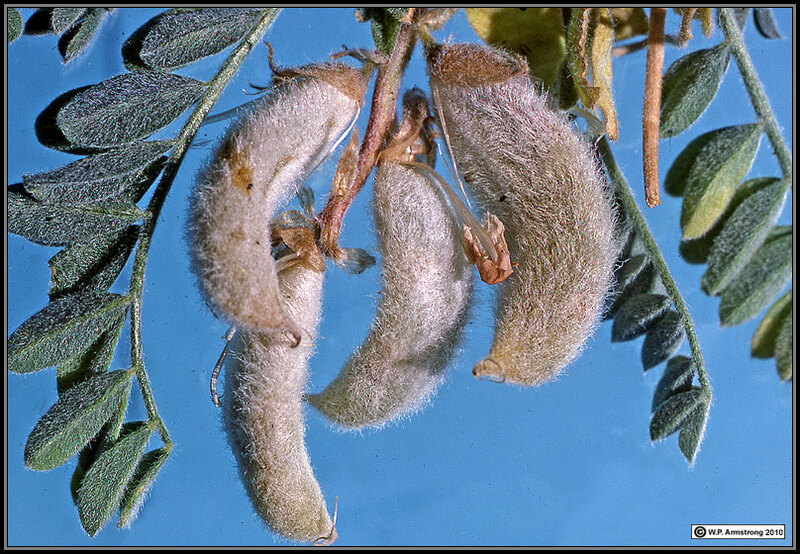 They are sometimes called milk vetches from the notion that milk secretion in goats was increased when they fed on the common Old World forage species (Astragalus cicer). Like many legumes, the leaves are typically divided into a dozen or more leaflets, and the flowers resemble small pea blossoms. Some species produce inflated seed pods that make a distinct popping sound if you step on them. Locoweeds are also called rattleweed because of the bladder-like, inflated pods, particularly when a gust of wind rattles the seeds inside. Astragalus is derived from a Greek word meaning anklebone, the plural of which means dice. 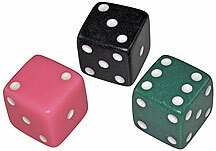 Perhaps the dice connotation refers to the rattling of seeds inside papery pods, like the sound of dice in a thrower. In anatomy, the astragalus or talus is one of seven bones in the ankle joint. Anklebones were apparently used for dice by ancient Greeks, and to this day, veteran crapshooters in Las Vegas refer to dice as "bones." 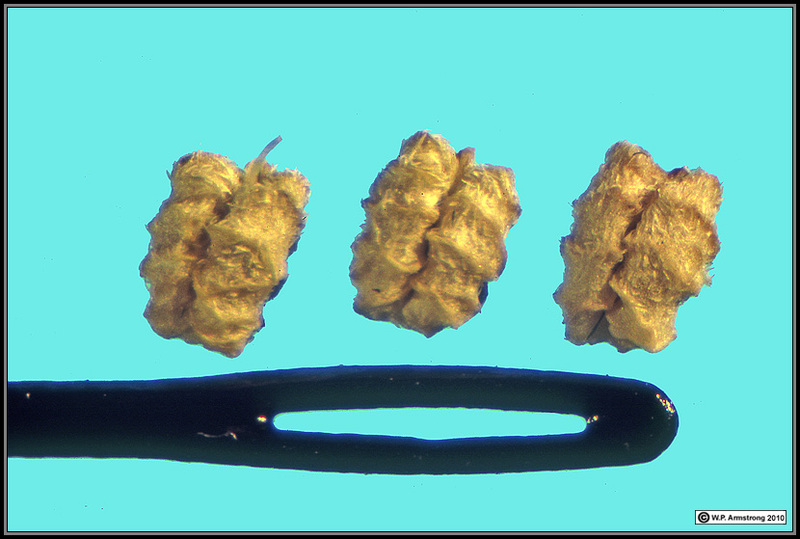 Since adult astragalus bones are a little too large for dice, some of the smaller, cuboidal or cuneiform anklebones were probably used. ** Some authors subdivide Euphorbia into several genera incl. the prostrate sandmats (Chamaesyce). The On-line Plant List By Kew & Missouri Botanical Garden gives 2031 species for Euphorbia. for the genus Astragalus, 2029 species for Carex, and 149 species for Rosa. Working List Of All Known Plant Species. 2011. Kew & Missouri Botanical Garden. In other words, if all the 250,000 species of flowering plants on earth were lined up at random, every 4th species would be a sunflower (Asteraceae), a legume (Fabaceae) or an orchid (Orchidaceae)! 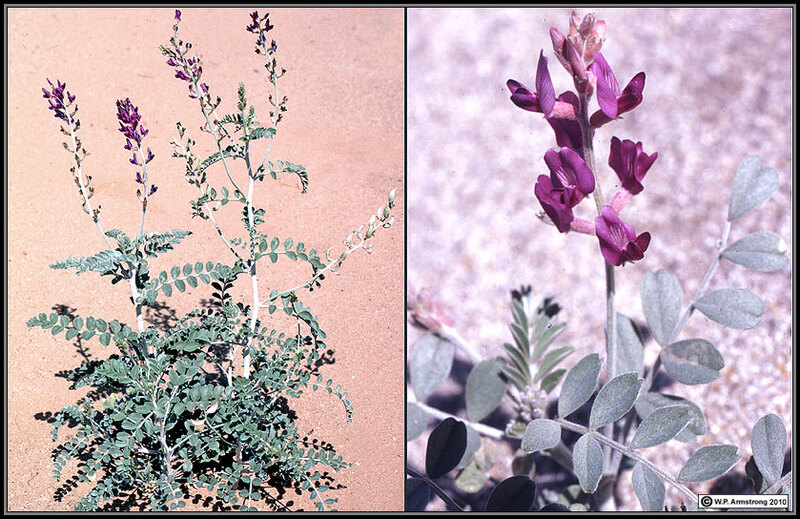 If you happen to pick a legume, the odds that it will be a locoweed (Astragalus) is about one out of nine. Barneby, R.C. 1964. 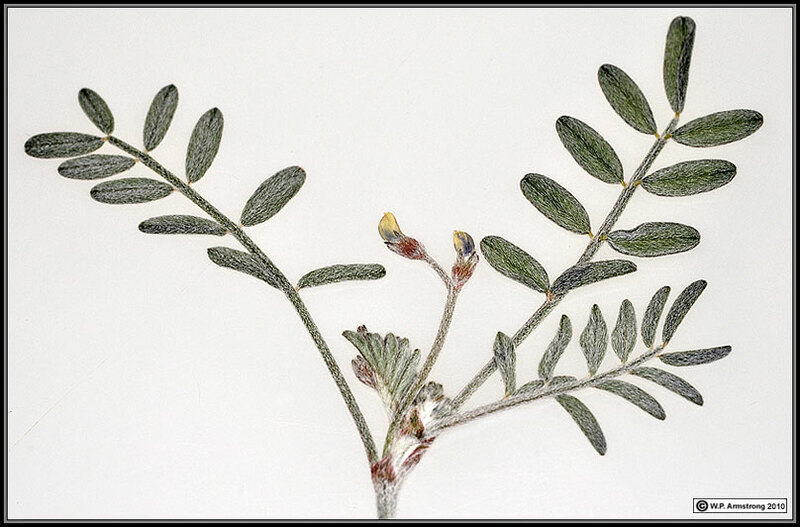 "Atlas of North American Astragalus." Volumes I & II. Memoirs of the New York Botanical Garden 13: 1-1188. 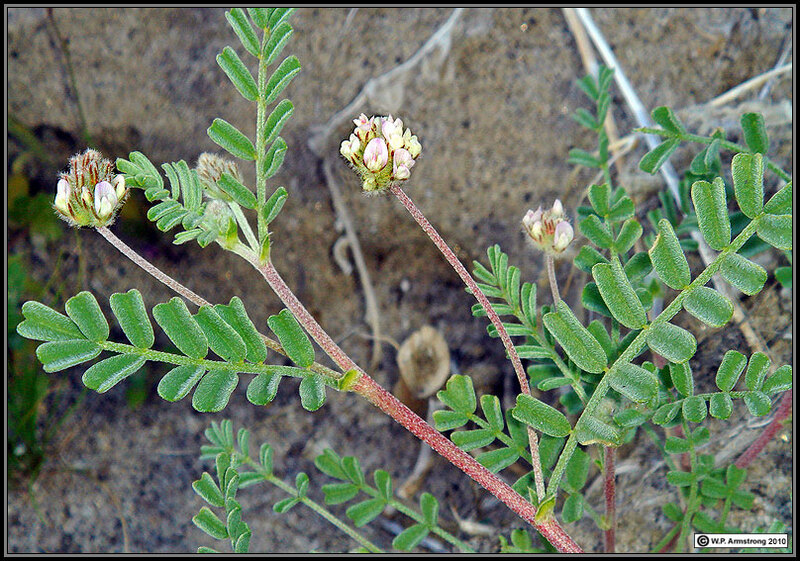 Astragalus lentiginosus var. 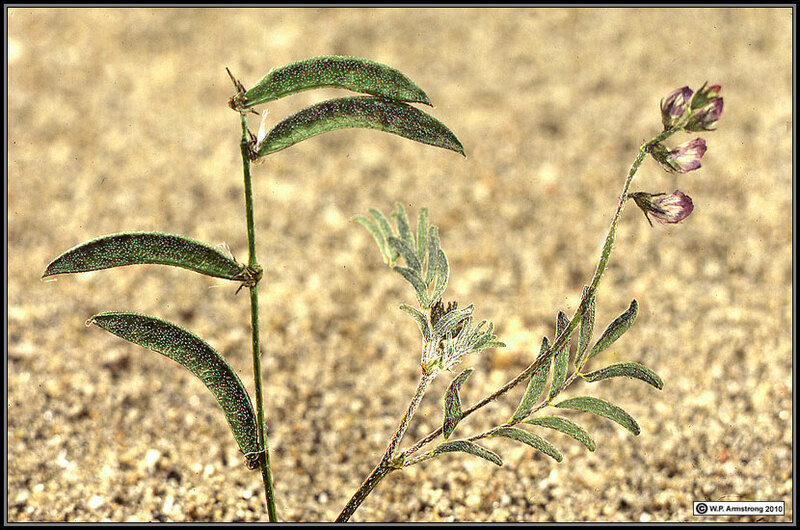 borreganus, an endemic locoweed in the Borrego Valley area. 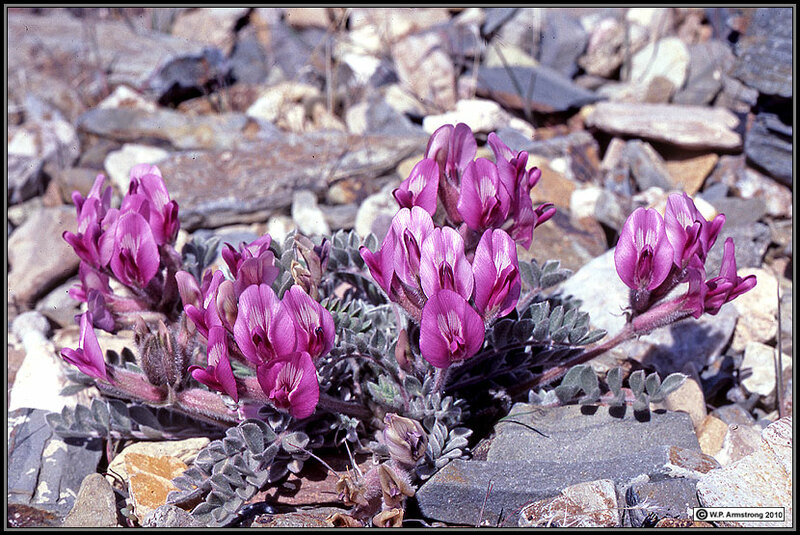 Desert dwarf locoweed Astragalus didymocarpus var. dispermus, a common prostrate annual in sandy areas. 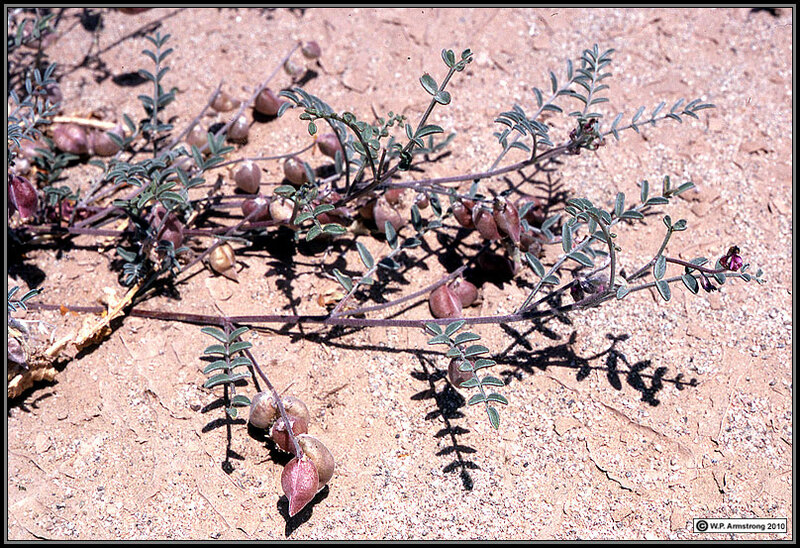 Small seed pods of Astragalus didymocarpus var. didymocarpus. Astragalus aridus, an uncommon annual locoweed with silvery appressed hairs. 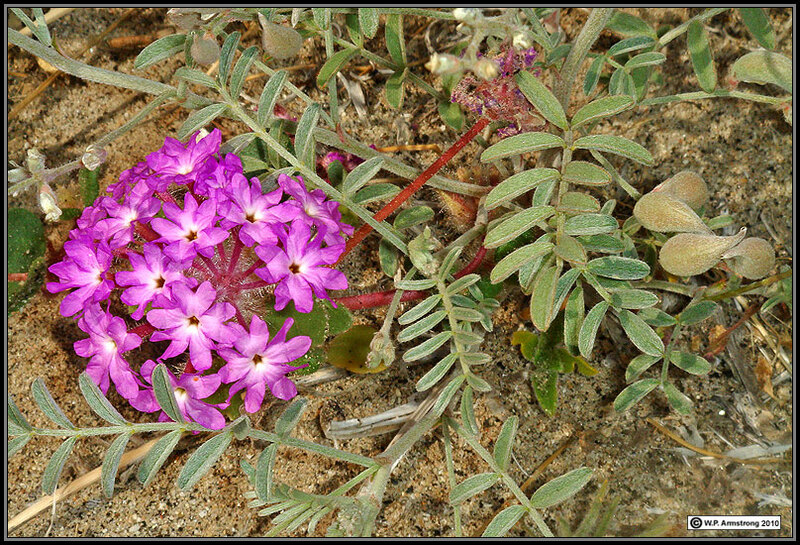 Sand verbena (Abronia villosa var. 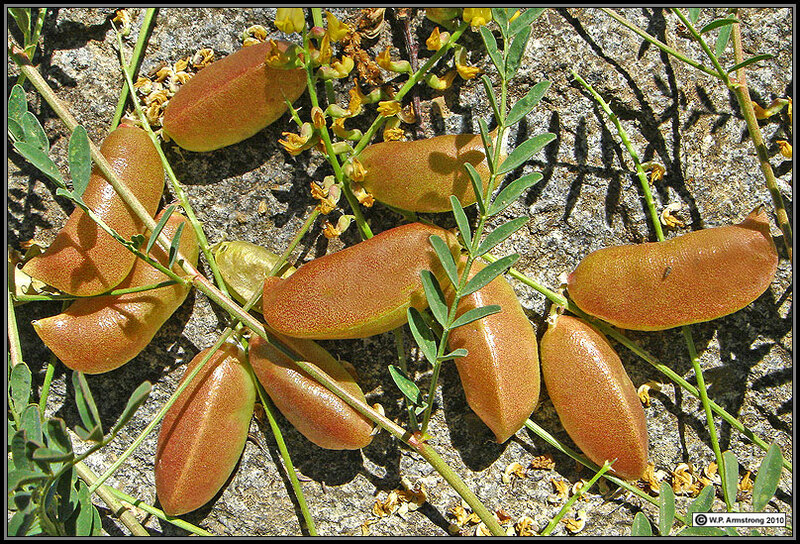 villosa) & seed pods of Astragalus aridus (right). 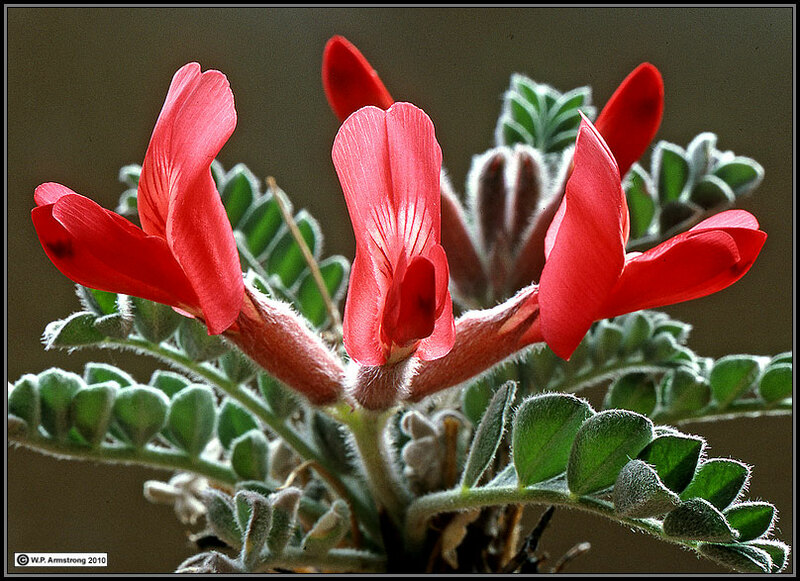 Astragalus palmeri, a perennial locoweed native to the Anza-Borrego Desert region. Unlike the erect habit of Astragalus lentiginosus var. borreganus, this species typically has a low, spreading growth form. 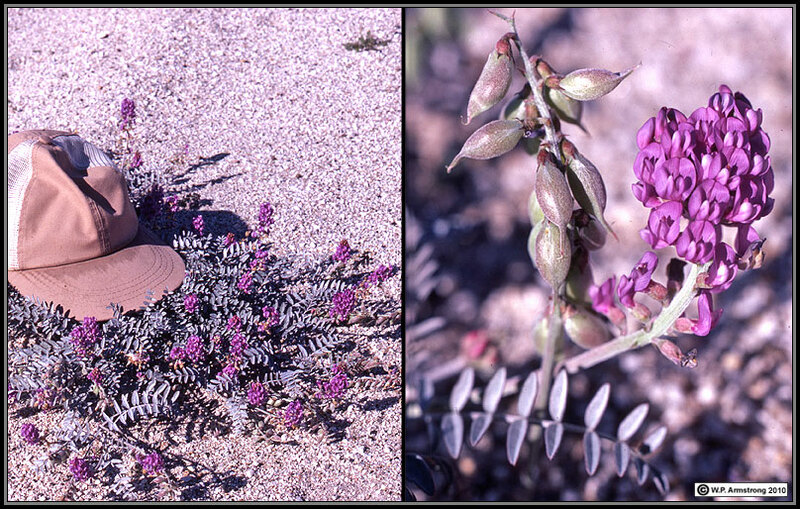 Astragalus crotalariae, a perennial locoweed in the badlands east of Borrego Springs. The peculiar malodorous scent of dried specimens lasts for years in herbarium cabinets. It is one of the species of locoweeds known to concentrate toxic levels of selenium. Astragalus nuttallianus var. cedrosensis: A small annual locoweed. Astragalus insularis var. harwoodii (Harwood's Rattleweed). Astragalus magdalenae var. 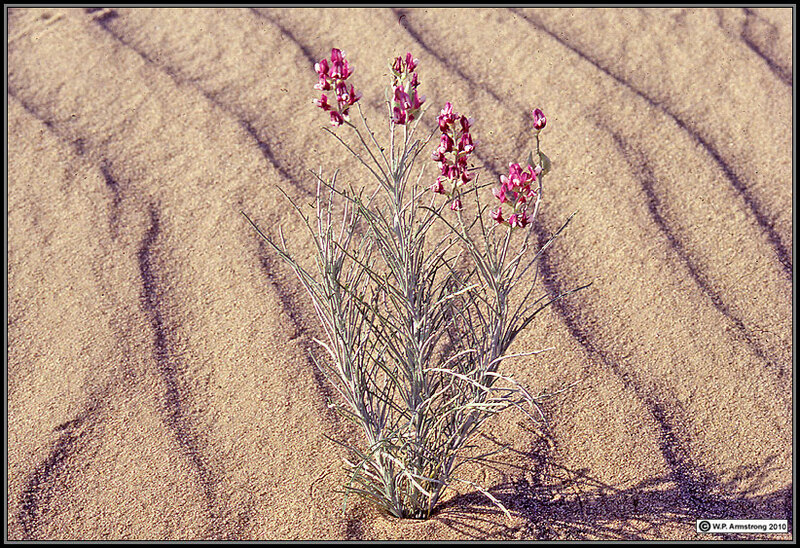 piersonii (dune locoweed): A rare endemic native to the Algodones Sand Dunes. Astragalus douglasii ssp. parishii on the crest of the Laguna Mts. overlooking Anza-Borrego Desert. This perennial locoweed has inflated, bladderlike pods that rattle in the wind. Astragalus leucolobus: A rare perennial with fury pods native to the San Gabriel Mountains. 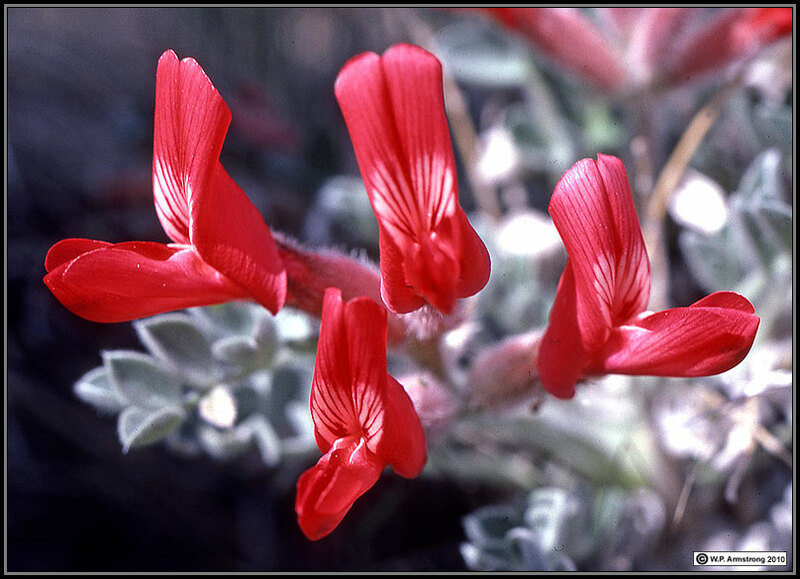 Scarlet locoweed (Astragalus coccineus) from Mountain Springs Grade. 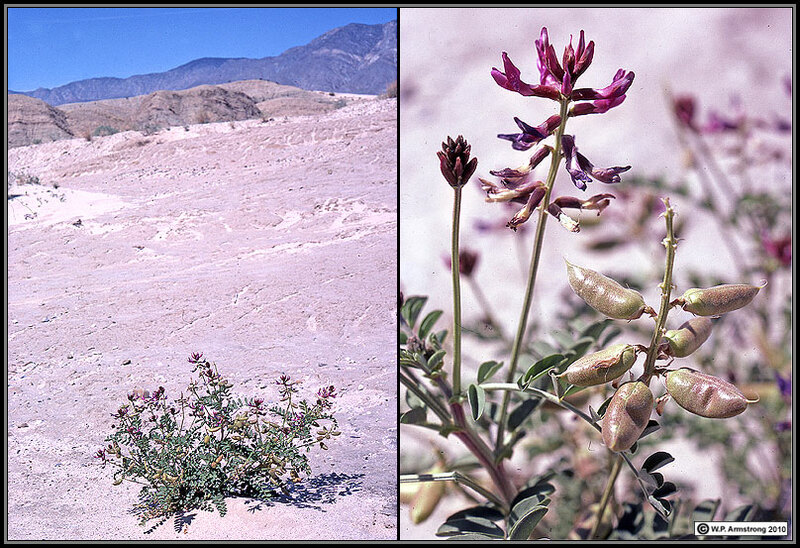 Astragalus funereus: A rare endemic to the Funeral Mountains of eastern Death Valley.